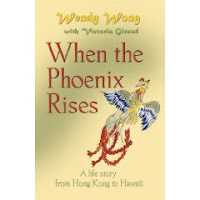 In her memoir, ‘When the Phoenix Rises’, author and renowned business woman, Wendy Wong, shares a unique and fascinating life story about her struggle to emerge from a life of poverty in Hong Kong, China, to that of a successful business woman and mother living in Hawaii. Wendy begins her story as a young girl living in abject poverty in Post World War II China. She shares a childhood of bleak conditions where her father and mother could barely make ends meet. She recalls an incident where she woke in bed one night to feel the bloody fur of a mouse that was dying from poisoning in her bed. From her son’s outstanding education path, to providing her developmentally challenged daughter with many resources to help her find her own place of contentment, readers will discover that it is Wendy’s children and their success that keeps her grounded and focused. Wendy’s determination regarding her education, business ventures, and personal relationships, helped shape a modern day feminist outlook on life. The experiences and accomplishments she shares along with the setbacks, both personally and professionally reveal how her character and moral convictions evolved. ‘When the Phoenix Rises’ is an inspiring journey of how one woman overcame insurmountable odds not only to find herself, but to gracefully embrace motherhood as a working mom. The memoir is highly recommended as an inspirational story of modern day feminism rooted in a strong cultural motif.